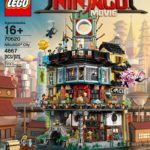 For me, the sets coming out of The LEGO NINJAGO Movie theme have been a big step up. The ideas are original, and many of the sets, while scaled down compared to their on screen counterparts, translate really well to a suitable release size. 70618 Destiny’s Bounty is no exception. When we first saw the box art for these sets, I was incredibly excited. I knew I had to have a copy of 70618 in my collection. 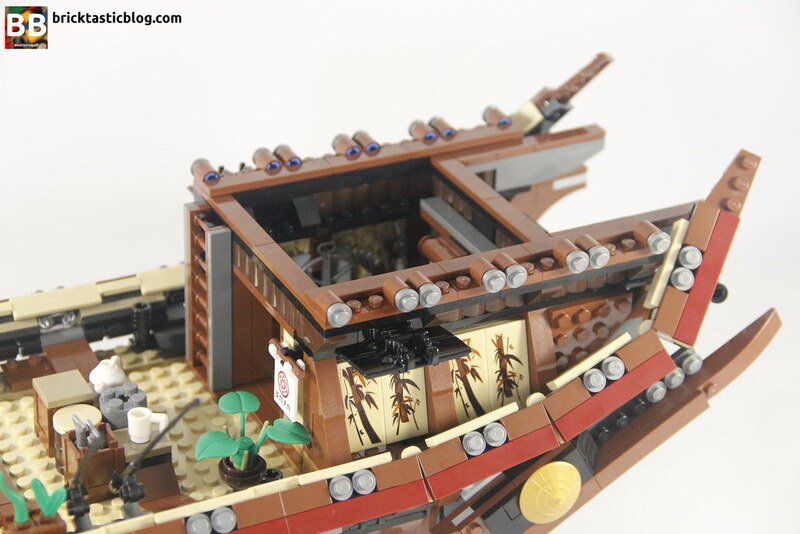 LEGO has created some brilliant seagoing vessels before, with 10210 Imperial Flagship immediately coming to mind (it’s one I’d still love to have in my collection), however I reckon this Chinese junk style boat is a step up even from 10210, and one of the best releases of 2017 in my mind. 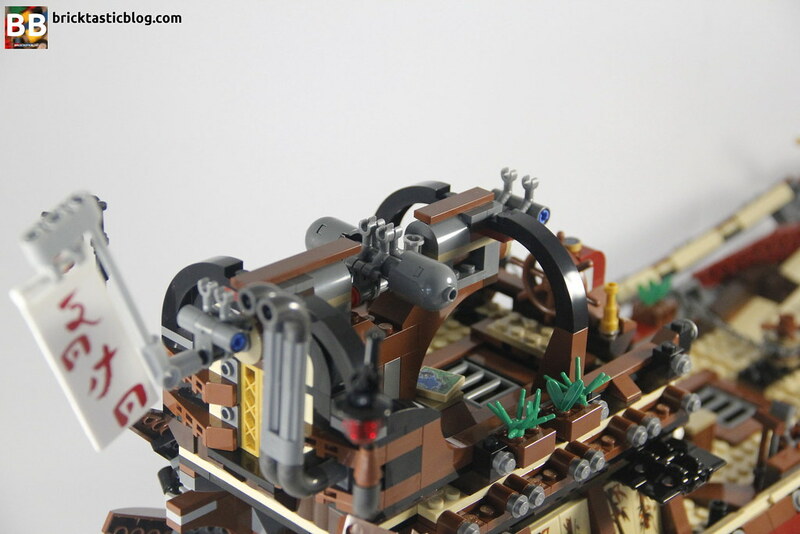 It’s also not the only time the Destiny’s Bounty has appeared in LEGO, although there’s a monumental difference in the three iterations. The first appearance was in 2012, with 9446 Destiny’s Bounty. A small twin sailed vessel of 680 pieces, it still had definite similarities, but the scale was completely different. in 2015, 70738 Final Flight of Destiny’s Bounty came out. It was a completely different looking ship, and bigger at 1,253 elements, as this version could fly. Although much more detailed, it had nothing on what the modern version had, and the title of the set implied that it didn’t bode well! Anyway, I’m not looking at those two, I’m looking at 70618. Let’s get stuck in. 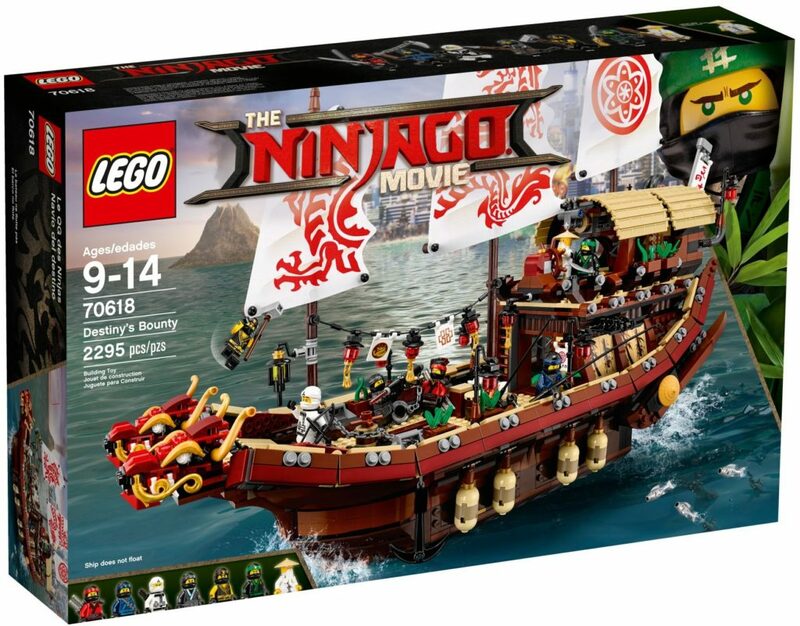 The beautifully designed box has the ship floating on a calm sea outside NINJAGO City. Inside the box, it’s pretty full. There are 15 numbered bags, two un-numbered bags of big parts, a cardboard reinforced bag of sails, the rather thick instruction manual, and a sticker sheet with 22 stickers. 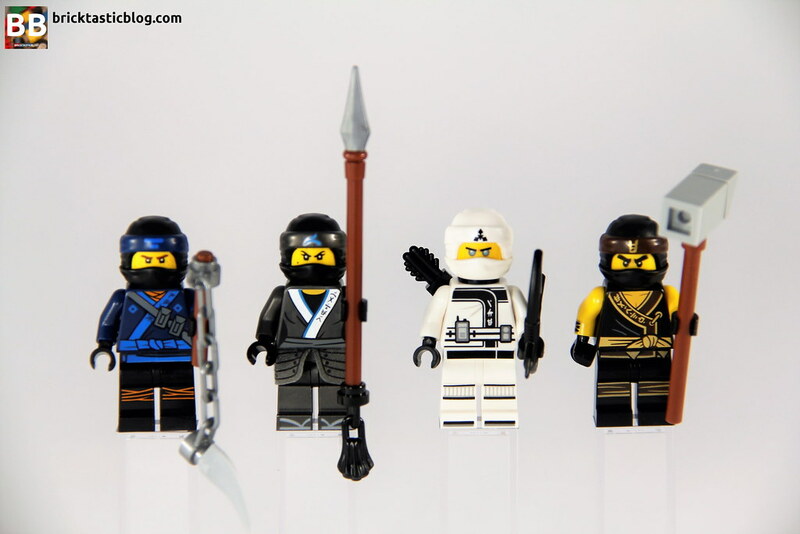 There are seven minifigures included in this set, and it’s the only set to include all of the ninja in their full ninja garb, called shinobi shozoku. Let’s start with them. I really like the masks they wear – they fit together so seamlessly, the first time I saw them I thought it was one piece and had no idea how it got on the head! 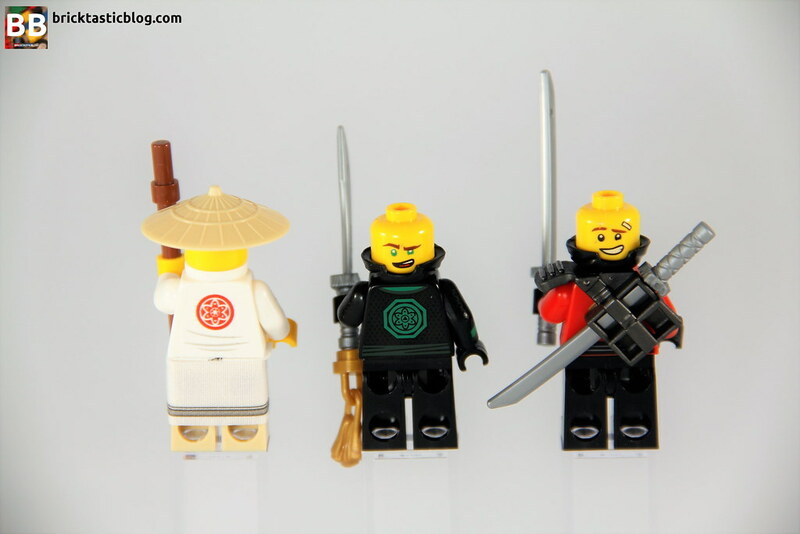 The NINJAGO text on the edging also spell out the elements of each of the ninja (except for Lloyd – you can figure that out for yourself). It’s a great addition and only adds to the playability aspect. 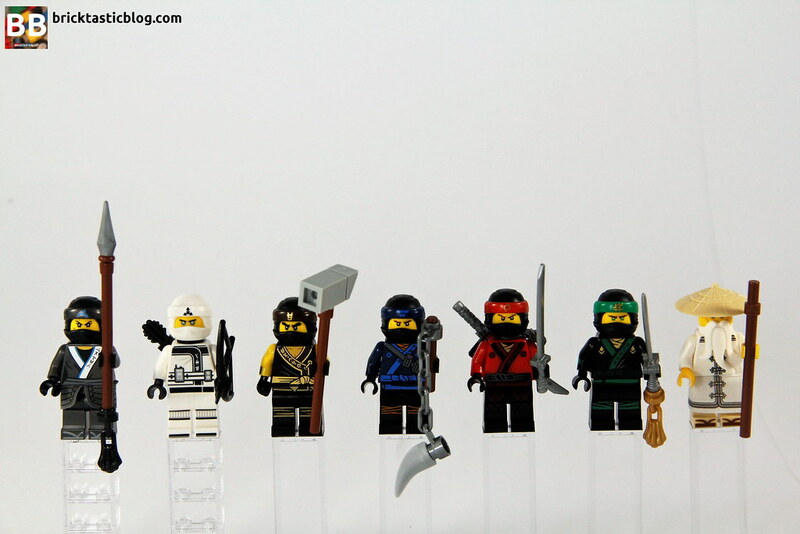 Also common to all of the ninja are double sided heads and back printing. Nya, the water ninja, is dressed in a grey shinobi shozoku that has blue trimmings. She’s also got grey thongs on her feet, a fabric skirt which appears armoured, and arm printing – some metal-like elbow guards. Nya’s weapon is a large spear-like weapon called a ryo shinogi yari. Zane, the robot ninja with the power of ice has the most unique garments, as they’re white and are folded differently – they’re much more straight lined, which suits the robot well. He’s got a walkie on his belt, carries a bow (a yumi) and has a sheath of arrows on his back. Cole is the more muscular of the ninja, and has a sleeveless shinobi shozoku. There’s gold and brown trimming on his, which links in seamlessly to his legs, indicating that he is the earth ninja. Cole’s weapon of choice is a big warhammer called an otsuchi. Jay is the lightning ninja. He’s got blue and dark blue shinobi shozoku, a grey utility belt, orange wrapping on his knees, and what I like to believe is his orange scarf visible at his neck. He’s got freckles on his face, and has a chained blade called a kusarigama as a weapon. Kai has a red robe with red band around the head, and what looks diamon armour on his legs. It looks awesome. He’s also got a couple of katana on his back, which also incorporates a shoulder guard in the sheath. Lloyd, the fearless leader of our bunch of ninja wears a black shinobi shozoku with green trimming. It looks awesome. Lloyd’s weapon is a single katana with a tassle at the end. He’s also able to wield the laser pointer that’s seen in the film as the ultimate weapon. It’s very cleverly put together. Master Wu hasn’t changed a lot in 6 years. He’s gone through some minor costume tweaks here and there, but he’s not lost his iconic conical hat. He’s looking pretty happy under his beard, and has got some printing on the front and back. I like the fabric section that matches his torso design, and the sandals (in Australia we call them thongs) printed on his feet. He’s also got a bo staff. There aren’t many brand new elements in this set with the sails being pretty much it, but there are a large amount of elements in new or rare colours. 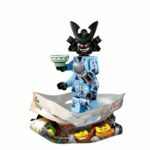 We’ve got a selection of 2×2 half tiles, which by now are in a large array of different sets, particularly in the NINJAGO sets. These come in two colours – reddish brown and black. There’s also a recoloured dual scabbard, which looks great hung up on a wall, as it’s got a shaft on the back. We also get new coloured garage door elements, which are actually called lamella. 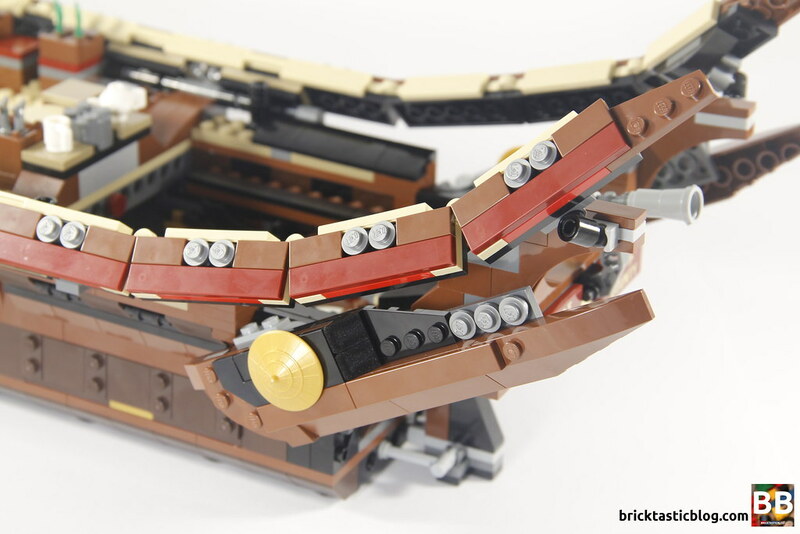 I had to search for a definition for this as I’d not heard it before, but it’s apparently “a thin layer, membrane, or plate of tissue.” There you go – BricktasticBlog is educational, too! Some of the other noteworthy parts include a new map tile (with Destiny’s Bounty printed on it), green feathers – surely to be useful in a garden MOC, olive green stalks, gold bananas, a white teapot, tassels, and a selection of elements in warm gold and other beautiful colours. There’s not a huge amount of brand new elements, but when the set looks this good, it doesn’t matter. Not only this, but there are the stickers, which are quite versatile, and could be used in MOCs with a more Asian influence. The options for play on this set are excellent. With a wide range of accessories for the ninja, plus a solid armoury full of weapons, as well as a highly detailed and well thought out interior and deck, there are plenty of things to keep little (and big) hands busy. There’s a huge level of access to the ship too. Decks and levels can be removed, and the garage door roofs can be rolled back to access the bridge. There’s also some puzzle solving with the NINJAGO script. There are plenty of references on the web to help you out, but what I find best is solving it with what you know already (hint: try figuring out what the ninja robes say). One thing I would like to have seen that would have increased the playability a bit more though – a foe. 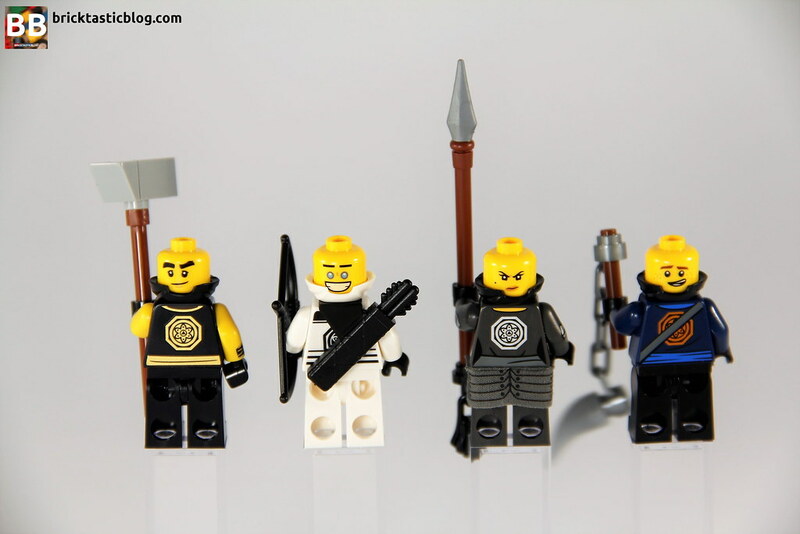 All of the minifigures are good guys. Adding in a bad guy would increase the options for playing out a good versus bad story, which is the backbone for both the movie and the theme. 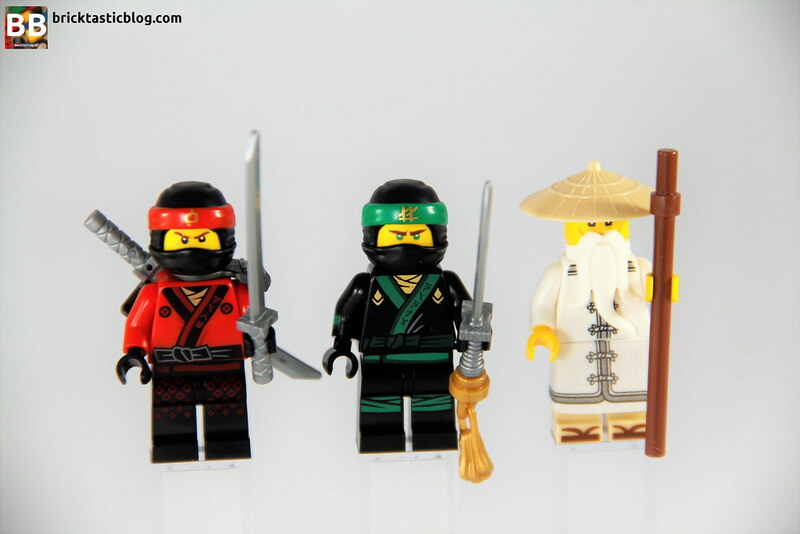 It doesn’t have to be Garmadon – a general would do. In saying that, if you can afford a set like this, you’ve probably got some of the smaller ones which have a large assortment of the baddies. Either way, this set is a lot of fun to play with and ‘float’ across the carpet. After some basic construction of the hull, it’s interesting to note just how much the vessel expands not just upwards, but outwards. The base footprint (hullprint?) is remarkably small for what ends up being a substantial ship. To be honest, the beginning of the build is very underwhelming. It doesn’t last long though, as detail gets added very quickly. 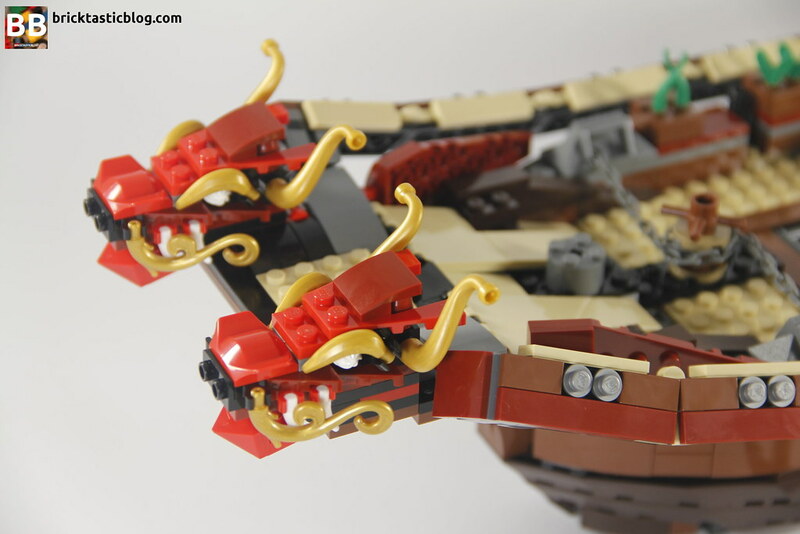 There are also not many of the large ship elements – most of the build is standard bricks and TECHNIC parts. 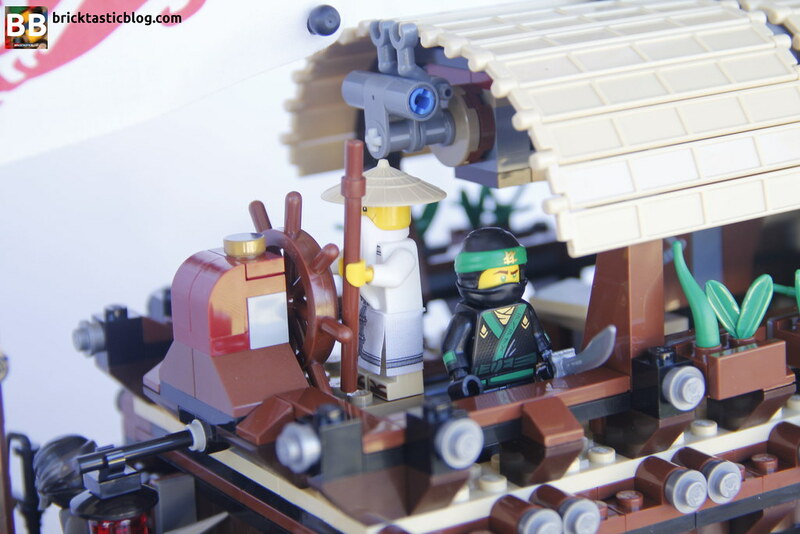 The lower deck is reserved for Master Wu’s quarters. The SNOT walls are added first, followed by the interior details, including some shelf space for a family portrait and what appear to be battle trophies, a basin and toilet, a desk with pen and inkwell, and a brilliant looking bed. 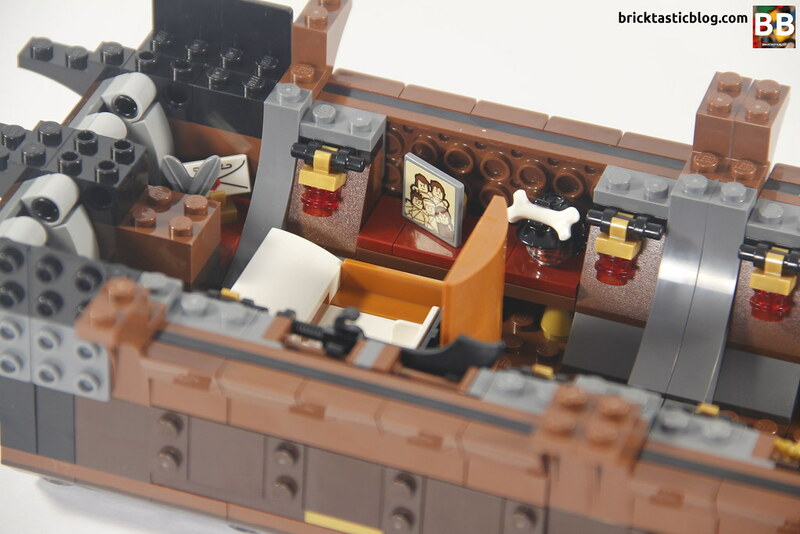 Not only does the bed look great, but it’s the first functional bed I’ve seen in LEGO form. The cover is on a hinge, with space inside the bed for a minifigure to rest their weary plastic heads. When closed, it looks like they’re all tucked in. It’s a brilliant design choice and was a lot of fun to build. There are also plenty of bladed weapons to choose from down here. The use of SNOT fences as weapon racks is clever. They attach to the outer walls and look seamless. There’s another SNOT fence used as a ladder to the upper decks. The very rear of the ship also uses tiles on rotating axle plates, so they can flip to become the rear walls of the ship. It’s an incredibly clever approach. 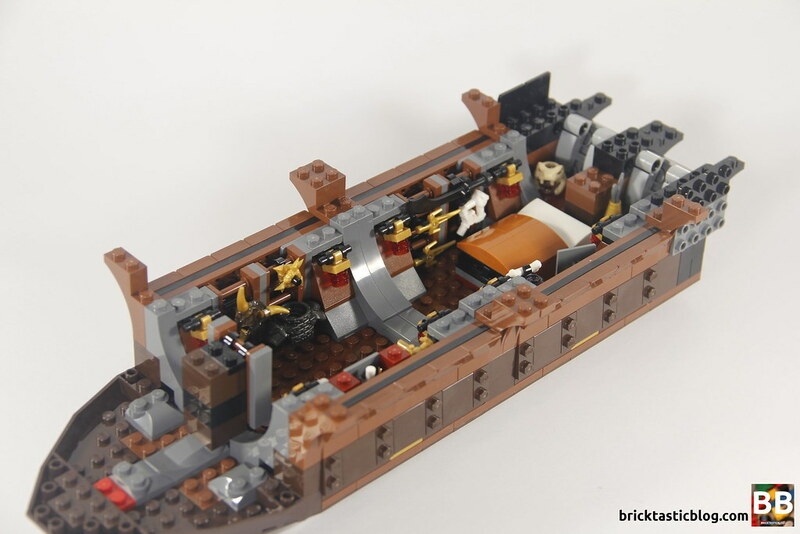 The next few bags add the main deck to the vessel, the extension at the front of the ship that will eventually hold the two dragon figureheads, the rear balcony with telescope, the remainder of the rear hull, and the curved gunwales to the sides of the ship. There are some storage items available at the centre of the main deck, a neatly executed grate in the deck, and a dual anchor structure, making use of a technique we’ve seen before in larger nautical builds with a working windlass. 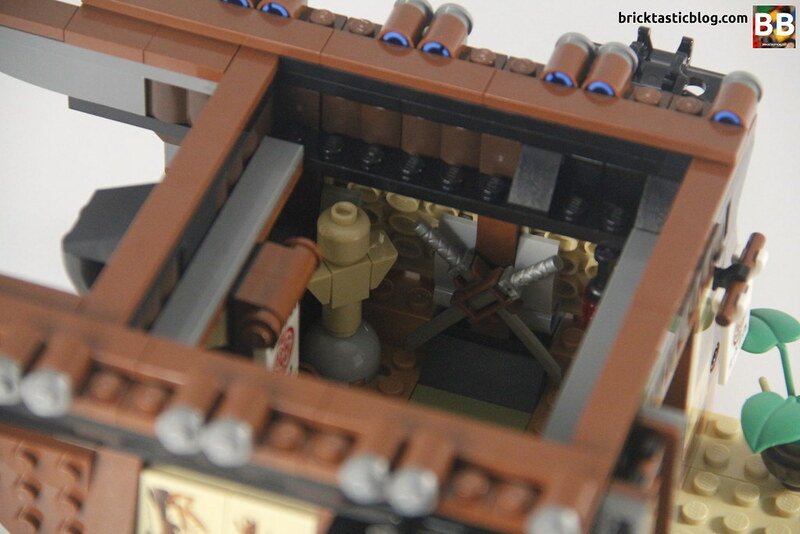 There’s also some hidden compartments in the front of the ship for yep, more bladed weaponry! The gunwales are connected to the rotating 2×4 plates in the middle of the ship, with a ball joint at each end. If you’re nitpicky for design like me, you’ll spend a good few minutes getting the upper curve at the rear of the ship just perfect! Be warned though, it will move slightly. If you look from above or below, the gunwales don’t connect the whole way along, but from the side it looks magnificent and adds more depth to the build overall. Let’s talk about those dragon heads for a bit. These aren’t just ordinary figureheads. 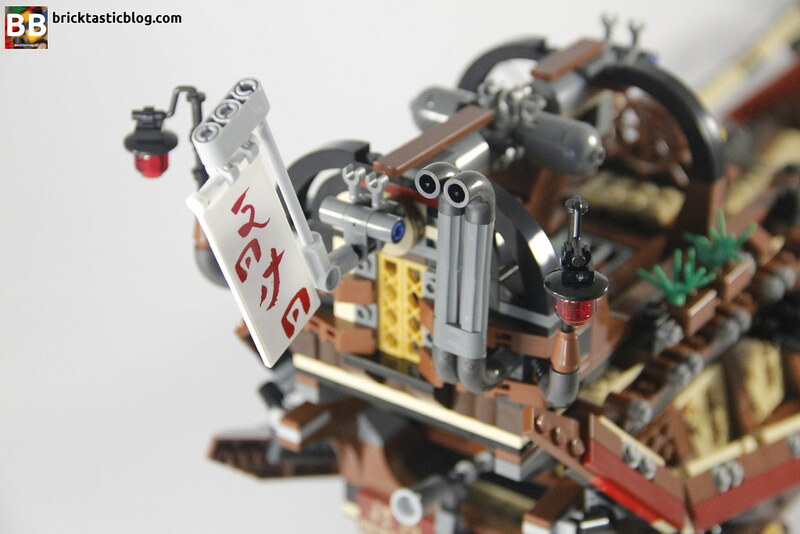 They’re built with an excellent attention to detail, and use some brilliant parts to do so. There’s golden tail elements, golden bananas, what I call the “whipped cream 1×1“, just to name a few. The jaws also move up and down, as well as the front platform they rest on, although I’m not really sure why – maybe for those jettys that are higher than the ship? Who knows. The rear of the hull is added, using 4×4 turntable elements to position them correctly. these add some more styling to the vessel and look excellent. I also think they hint at the mysterious flight capabilities that other versions of the Destiny’s Bounty have had in the past. The next level to be added is the middle deck – this houses the Destiny’s Bounty dojo. There are some excellent details visible, and the use of the large caterpillar tracks as a small section of cover is quite clever, although I’m not the biggest fan of the look. The top (what is normally considered the inside) looks messy. The use of the stickers as wall coverings looks brilliant, and inside the dojo there are still more weapons, some of which look quite menacing! There’s also a fantastic looking sparring dummy tucked away in a corner. The rear windows are also very cleverly put together, using more SNOT technique. Sitting directly on top of that is the bridge. There’s what appears to be an engine, as well as the wheel and map table with sextant. 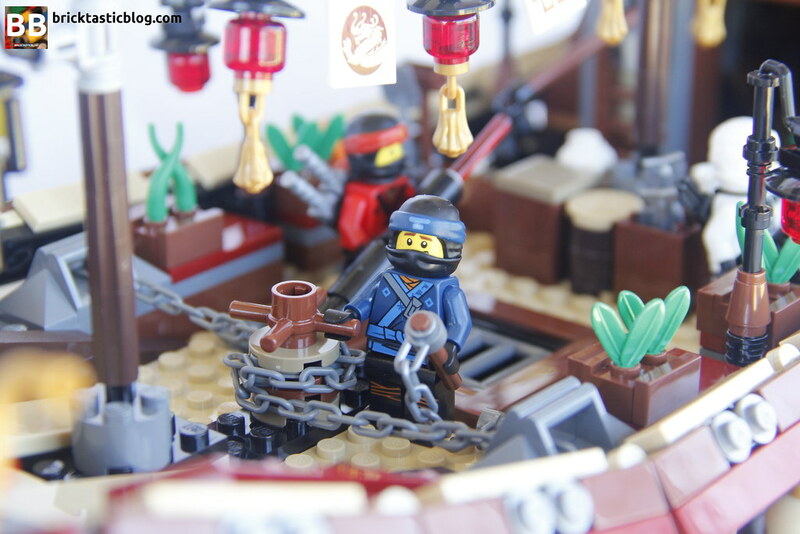 At the back of the ship at this level are some lamps, and a sign in NINJAGO script next to a couple of exhaust pipes. There’s also the mechanism for connecting the garage doors to the vessel. The last major step is to add the garage door roof, the masts and sails, and the bouys hanging off the outside. 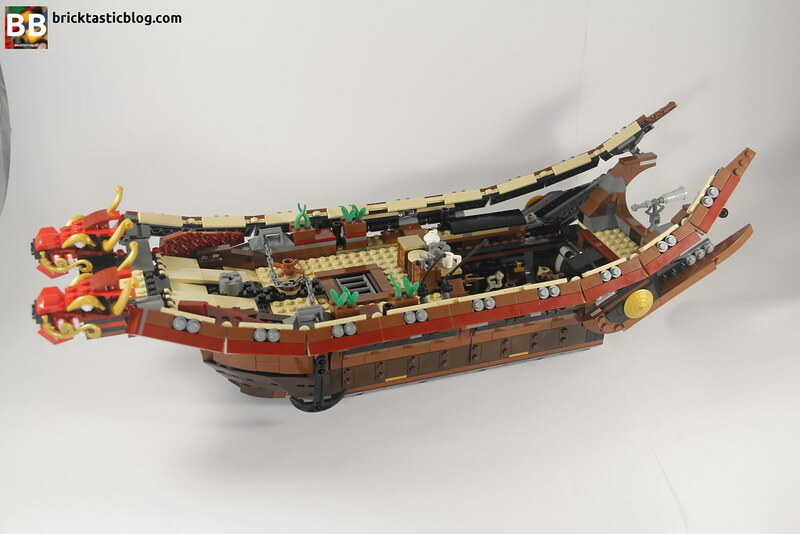 These are completed using a selection of TECHNIC elements, and although the sails are one sided, they still look fantastic, and are enjoyable to build as the full size of the ship is realised. It’s big! I still stand by my statement, and I know I’m not alone in thinking this, that the NINJAGO lineup for 2017 was the strongest across the board. 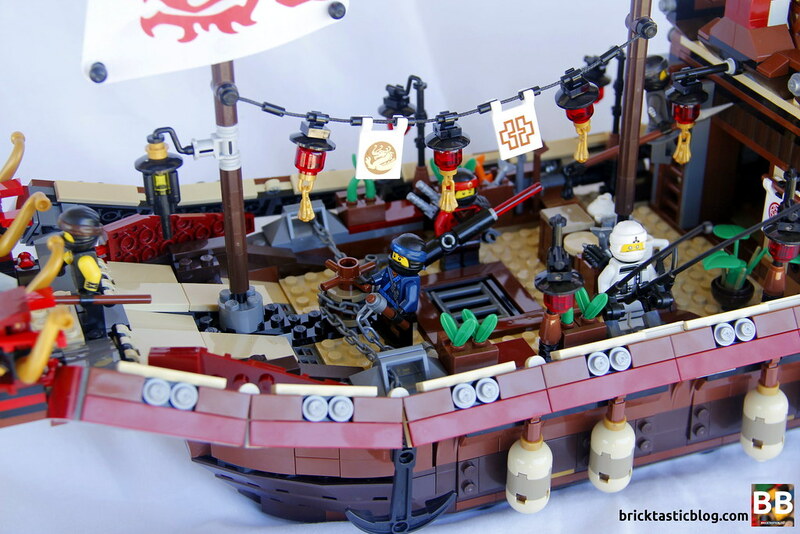 Not counting the gorgeous NINJAGO City, 70618 Destiny’s Bounty is leading the way in both design and appearance. It’s massive, which is always a drawcard for me, especially when it comes to ships. There’s also a mixture of old and new, which is often depicted across Asia. The mixture of old time wooden junks and a relatively modern engine at the back is excellent, and also that the designers decided to hide the engine away from view. It makes for a nice little detail when showing people. 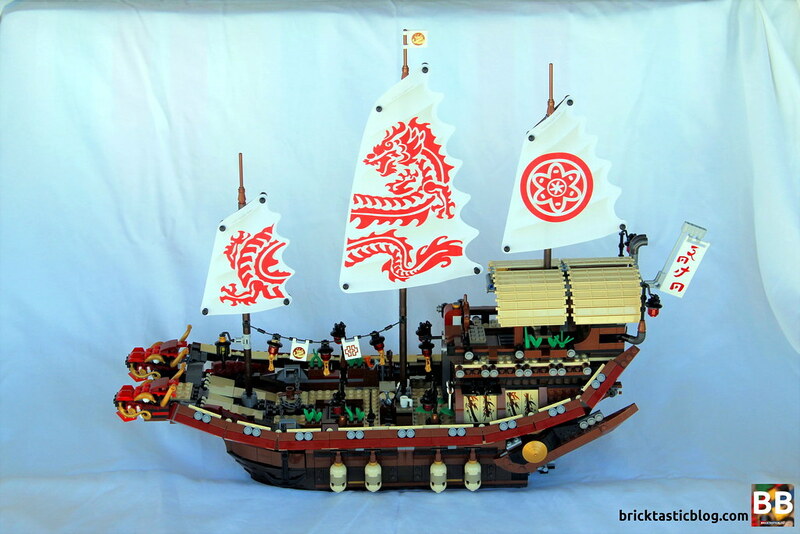 The profile is brilliant, and has so many of the similar details to a proper Chinese junk. The colours are perfectly matched, with no mismatched or garish details. One of my favourite colour inclusions in this is the greenery of the planter boxes. It shows that it’s a living ship, with permanent residents, plus the green is a beautiful offset to the rest of the darker colours. The lanterns and flags strung between the two forward masts are another beautiful addition. It’s a shame that the sails are only one sided, as this limits the display options somewhat. It can be displayed from the ‘rear’, and it’s displayed that way on the back of the box itself, however with the masts visible it does take away from the initial impact when viewing from the front. I do like that the dragon detail on the sails is continued through two of them. The back of the Destiny’s Bounty is also brilliantly designed. It stretches out over the water, and the inclusion of the balcony with telescope, for Master Wu to read the stars, as well as the rudder, is clever. With so much detail everywhere else, I’m glad the back wasn’t forgotten. The extra detailing on the rudder does mean it’s not able to be moved, regardless of the fact that it’s connected primarily with a ball joint. The different levels and decks of the ship can also be removed for easy access to the interiors, and clip firmly back into place for display. The whole vessel is incredibly strong and durable. Feel free to scoot this around the carpet! This set is a phenomenal example of value for money. At AU $259.99, that works out to be around 11c per element. That at a base level evaluation is incredibly good. Not only that, but you get a great amount of useful parts, and another unique ship. There are so many factors to think about when weighing the Destiny’s Bounty for your collection. It’s an immediate yes you need it, of course. I’ve come to this conclusion because it’s a ship (a big drawcard for many fans), it’s from a theme that doesn’t usually have ships, it’s incredibly detailed, is massive, and has all six ninja in their full ninja gear. It’s also quite affordable and as I’ve already mentioned, an incredibly good value for money set. Have you got a copy of the Destiny’s Bounty sitting on your shelves? Let me know what you think of it!